HTC like other major manufacturers has understood market matters, particularly that high end devices which cost too high always require a ‘mini’ of it, which the other segment of buyers can enjoy. HTC’s fabulous ‘HTC One’ which is thought of by many as the handset of the year, is going to have a baby brother. The Taiwanese company thought it sensible to launch a new HTC One mini, with some very attractive sounding specifications. We don’t know for sure what the specifications will be, however the rumor mills have churned out some details that we find pretty interesting and more than just appreciable. The internet has recently been stormed with news about the possible specifications the HTC One Mini could come with. A couple of sources, one @evleaks and also PhoneArena have confirmed the specifications leak which is doing the rounds. The former source refers to the Mini as M4 which is apparently the name nicked by HTC. These rumors suggest that the new HTC One Mini or M4 will have the same appearance as the present version in the market. The new device features the same appeal in terms of design but slashes some features, making it the ideal smartphone for those who want a smaller device, and also one at a cheaper price, instead of going after the enormous sized expensive device offered by prominent smartphone manufacturers. As per the rumors, the specifications of the HTC One Mini state that it will come with a 1.2GHz dual core Snapdragon processor. The display is expected to be a 4.3inch display having a screen resolution of 720p. The device will come backed by 2GB worth of RAM. As for internal memory storage there will be 16 GB of memory space. The rear and main camera will be a 13 megapixel snapper; while the device’s secondary and front positioned camera will be a 1.6 megapixel one. The device will run the Android version 4.1 of the Jelly Bean Operating System and will come with a non-removable 1700mAh battery. Unwired View has released information only a couple of weeks ago which had a different reporting on the specifications of the HTC One Mini. Unwired View has also gone with codename G2 as being the Company given name for the One Mini and not M4. As debatable as it is as regards the veracity of these sources, Unwired View has released specifications that do not impress as much. According to this source, the One Mini will come with a less powerful 1.0GHz ARM Cortex processor. The device will not have a 4.3 inch screen and will really be smaller, having only a 3.5inch HVGA display screen. Internally there will be only 512MB worth of RAM, and internal space of 4GB which can of course be expanded. The rear camera is stated to be a 5 megapixel one, and there is no mention about the front facing camera. Also the battery is apparently a 1400mAh battery. Another spoiler that we don’t like by Unwired View is that they claim that the One Mini will work the Android version 4.0 Ice Cream Sandwich Operating System, which we deem to be totally inappropriate for many reasons. Sure this is a mini version of the glorious HTC One; however that flagship device should not stand proud further by giving it a lackadaisical younger mini version. The HTC One has a uni-metal body, and works on a powerful Snapdragon 1.7GHz processor, and has LTE, and NFC connectivity. The display has a resolution of 1080 x 1920 pixels and there is also full 1080p video recording. Other rumors suggest that the One Mini will have the same Ultrapixel camera too, and will also have 4G LTE. Either way HTC has sensibly found a mini version, while other manufacturers, are bringing in their own less powerful versions like the Apple’s iPhone 5s and also the exciting Samsung Galaxy S4 Mini. It is doubted that the HTC One Mini will have different versions, like the Samsung S4 Mini is rumored to have. Comparatively one version of the Galaxy Mini will have a dual SIM option, as well as having 3G HSPA+ and or 4G Long Term Evolution connectivity (LTE). All the versions are however stated to have a Super AMOLED qHD 4.3-inch display screen having a pixel density of about 26 pixels per inch. The iPhone 5S is stated to have a plastic casing, and come with a 4 inch display screen, having a dual core processor and an 8 megapixel camera. 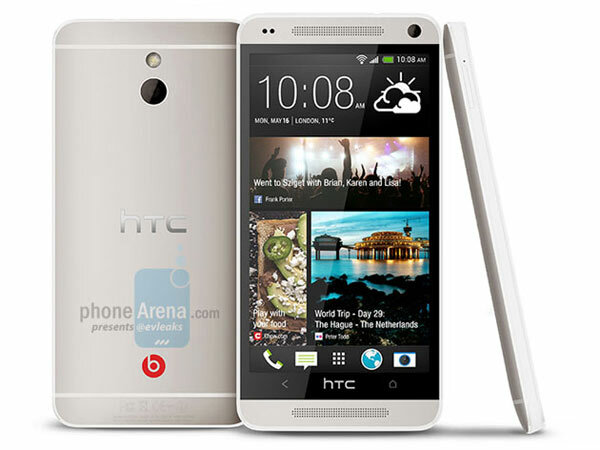 There is no mention in any of these rumors as to the possible launch and press release date by HTC, of the HTC One Mini. We still await official confirmation about the HTC One Mini from the manufacturer, and until then we will keep you posted on all the latest rumors about specifications and features.